Fischer CNC-Technik GmbH is an established company whose manufacturing facilities are situated exclusively in Neustadt an der Weinstraße, Germany. Here, at the heart of one of south-western Germany’s most famous wine-growing regions, the mid-sized family business has been producing the very finest of workmanship for over 30 years, and working with its prestigious customers to master new challenges each and every day. Alongside a passion for the job, it is essential that all employees have a long-term interest in the quality of their work. This is simultaneouslya quality guarantee for all customers, and is therefore part and parcel of the corporate philosophy. 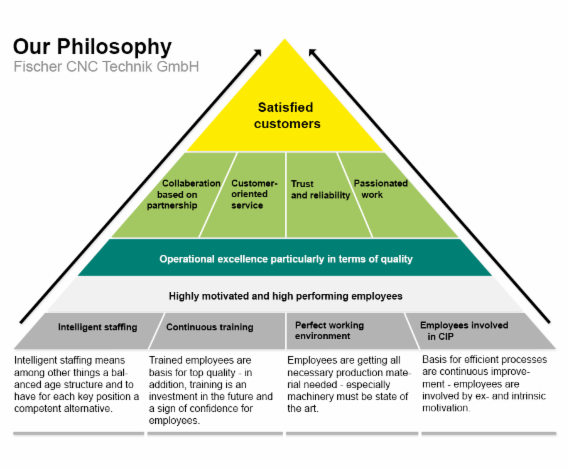 Other elements also include a focus on discretion and reliability in Fischer CNC-Technik GmbH cooperative partnerships with their business associates. As just one example, customers can take the company at its word when delivery times are stated or alternative manufacturing methods are recommended. Even when, in exceptional cases, this means customer orders cannot be accepted, as it is clear from the outset that requirements for time frames, quantities etc. simply cannot be satisfied. To successfully maintain its position in a dynamic and rapidly changing market over many years, a German manufacturing company requires other dependable pillars alongside a solid philosophy. Above all, these include the machine fleet and its employees.